This is the latest solution for tracking goods and assets around the world, locating equipment and patients in healthcare, reducing counterfeiting in the pharmaceutical industry and improving the management of moveable assets. This technology also offers substantial advantage over traditional methods used in the area of file tracking. What does this system have to offer the Healthcare sector? Radio frequency identification (RFID) technology has been in use for several decades to track and identify goods, assets and even living things. Generally speaking, RFID is the automatic identification and tracking of items through use of an identification chip or 'tag' that sends data to readers through wireless data communication. It is useful to think of an RFID system as one in which these tags enable items to 'speak' about their identity, location, activity or history through readers and ultimately, to application software that can process and utilise this information. RFID technology is already being used in many applications, such as for toll booth automation and self-service retail processes. In library and office environments, RFID technology allows the tracking and fast retrieval of physical files, thereby increasing overall efficiency and productivity. Currently, most of the focus is on basic identification of an item as it passes from location to location. This is similar to the way bar codes are used but with important advantages unique to RFID technology. Powering this vision is the prospect of having proactive visibility to the location and unique identity of each file or asset. Additionally, RFID eliminates the errors associated with the manual scanning of bar codes. There are an increasing number of applications for RFID and the business case grows stronger. There seems little doubt that the use of RFID is becoming more and more widespread and most businesses will be affected in one way or another. Implementing RFID technology for a specific application is a challenging process. Questions concerning process flow, the type of tag, radio range, reader and application software require careful consideration. 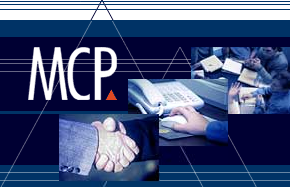 MCP can assist its customers in understanding RFID, making a business case for RFID, sourcing the right suppliers and in managing its implementation. There are five key components of an RFID system, though there are many variations of each component and combination thereof. An RFID tag [pictured] is comprised of a microchip containing identifying information and an antenna that transmits this data wirelessly to a reader. At its most basic, the chip will contain a serialised identifier that uniquely identifies that item, similar to the way many bar codes are used today. A key difference, however, is that RFID tags have a higher data capacity than their bar code counterparts. This increases the options for the type of information that can be encoded on the tag. An unlimited list of other information can be stored on RFID tags, depending on application needs. For example, in law offices, the RFID tag is affixed to individual physical file folders. Tags come in a variety of types with a variety of capabilities. tags contain data such as a serialised tracking number, which is pre-written onto them by the tag manufacturer or distributor. These are generally the least expensive tags because they cannot have any additional information included as they move throughout the supply chain. Any updates to that information would have to be maintained in the application software that tracks item movement and activity. tags enable a user to write data to the tag one time in production or distribution processes. This may include a serial number as well as other data, such as a lot or batch number. tags allow new data to be written to the tag as needed as well as enabling users to write over any existing data completely. Examples for the latter capability might include the time and date of ownership transfer or updating the repair history of a fixed asset. While these are the most costly of the three tag types and are consequently not practical for tracking inexpensive items, future standards for electronic product codes (EPC) appear to be headed in this direction. The amount of data storage on a tag can vary, ranging from 16 bits on the low end to as much as several thousand bits on the high end. Prices rise relative to the capacity. Passive tags have no battery and 'broadcast' their data only when energized by a reader. That means they must be actively polled to send information. Active tags are capable of broadcasting their data using their own battery power. In general, this means that the read ranges for active tags are several times greater than they are for passive tags. The extra capability and read ranges of active tags, however, come with a cost; they are several times more expensive than passive tags and batteries have a limited shelf life. Like all wireless communications, there are a variety of frequencies (low, high or ultra-high frequency) or spectra through which RFID tags can communicate with readers. Again, there are trade-offs among cost, performance and application requirements. For instance, low frequency tags are cheaper than high frequency or ultra high-frequency (UHF) tags, use less power and are better able to penetrate non metallic substances. They are ideal for scanning objects with high water content, such as fruit, at close range. UHF frequencies typically offer better range (a read range of 15 feet for passive tags and 100 feet or more for active tags) and can transfer data faster. They do use more power, however, and are less likely to pass through some materials. UHF tags are typically best suited for use with or near wood, paper, cardboard or clothing products. Compared to low frequency tags, UHF might be better for scanning boxes of goods as they pass through a bay door into a warehouse. The reader/writer sends an RF signal to tags to request the information contained on the chip. Upon receipt of this information, it is translated into a digital form and sent to the application software. Readers that act much like a bar code scanner, meaning they are tethered to portable data collection devices or to fixed terminals/PCs running application software. 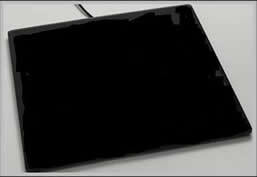 A tracking pad, like the one pictured, for file and document tracking is an example of this type of device. RFID Readers embedded into mobile data collection devices. This would typically mean an RFID reader that is internal to a portable wireless data collection device such as those used in warehouses, shop floors and by transportation personnel. A handheld tracker is also such a device. Fixed readers, which are mounted to automatically read tags as a product passes near them. Examples include readers mounted on conveyor belt equipment, readers mounted on entry points to the back room of a retail store, 'portal readers' placed at dock locations to automatically read tags as a product is shipped or received, and readers mounted on material handling equipment. Unless a company uses a read-only tag serialised from the tag manufacturer, the capability to write data to the tag will also be necessary – whether this capability is once or many times, depending on the type of tag (as previously described). Readers themselves can and often will serve as the 'write' or encoding mechanism but not always. Many companies will also use a new generation of traditional bar code printers that can print both human-readable data content and bar codes, while simultaneously writing data (serial number, etc.) to a tag inside the label construction. This can ensure, for example, that the serial number on the label bar code is the same as the serial number on the RFID tag. Middleware provides drivers to retrieve data from the readers of various hardware manufacturers. Not every tag will be read just once and sometimes a tag is read incorrectly. Middleware uses embedded logic to aggregate, purge and filter tag data thereby 'cleaning' the data feeds to the application software. By monitoring multiple readers, middleware can detect the movement of RFID tags as they pass from the read range of one reader to another. This directional movement detection can be captured and passed onto the application software as an inventory movement notification. Middleware will monitor tag/reader network performance to generate a real-time view of tags being read. It may also capture history and analysis of tag-read events for application tuning and optimisation. To drive value from RFID, or even to manage the process flow for RFID compliance requirements, you must deploy RFID-enabled software that processes RFID data, controls workflows and business transactions and passes RFID data onto other systems (such as EDI translators or ERP software) as required. Thus far, much of the publicly available information on RFID has been on the hardware aspects of the technology (tags and readers) or the description of business applications at a high level. Yet, the requirements and role of application software to utilize the technology and deliver business value is absolutely critical, whether in an asset tracking or compliance scenario or in driving internal supply chain improvements. No 'line of sight' requirements - Bar code reads can sometimes be limited or problematic due to the need to have a direct 'line of sight' between a scanner and a bar code. RFID tags can be read through materials without line of sight. More automated reading - RFID tags can be read automatically when a tagged product comes past or near a reader, reducing the labor required to scan product and allowing more proactive, real-time tracking. Improved read rates - RFID tags ultimately offer the promise of higher read rates than bar codes, especially in high speed operations such as carton sorting. Greater data capacity - RFID tags can be easily encoded with item details such as lot and batch, weight, etc. 'Write' capabilities - Because RFID tags can be rewritten with new data as supply chain activities are completed, tagged products carry updated information as they move throughout the supply chain. While 'two dimensional' bar codes like pdf-417 offer this capability to some extent, a new label must be printed and applied at each 'event', making multiple 'writes' impractical. Furthermore, bar codes cannot be attached to things like sensors to record environmental history. Durability - RFID tags are more durable than bar codes, which can become smudged and unreadable. Budget savings and risk improvements are key expectations from the system. A return on capital investment of less than two years is typical. In addition to direct savings, it is expected that some staff may be diverted into changed routines in order to affect the quality of the overall performance of the hospital and thereby to create non monetary improvements e.g. Any Hospital, of necessity, keeps Patient records files ('Casenotes'). The way that the Hospital manages these records is governed by standards administered by the National Health Service Litigation Authority (NHSLA) and the Healthcare Commission. Other legislation influencing compliance includes the Data Protection Act, Access to Health Records Act 1990 and the Freedom of Information Act 2000. Availability of casenotes is of paramount importance and good practice calls for continuous improvement in the management and control of them. In Hospital Trusts generally there is much evidence that substantial amounts of time are expended searching for files which are not in the expected place and whose whereabouts are then unknown. In exceptional circumstances, temporary files are created as an interim solution which brings its own problems. The system has proved to be highly effective in eliminating this situation. In a typical hospital there are many telephone calls and emails per day enquiring whether a file is in the Health Records Library. A means of knowing the whereabouts of a file at first enquiry would eliminate this 'traffic' and is exactly what this system can provide. The staff in the department often work under considerable stress and their goodwill is of the utmost importance in keeping the process working. It is desirable to minimise the difficulties and remove this stress. These issues are sufficiently serious to have attracted, in some cases, the interests of the Health and Safety Executive. These will be substantially removed. "Review records management policy, with a view to ensuring that it complies with the Department of Health's Record Management: NHS Code of Practice (2006)." "The movement and location of records should be controlled to ensure that a record can be easily retrieved at any time, that any outstanding issues can be dealt with, and that there is an auditable trail of record transactions." There are implications in the Trust NHSLA (formerly CNST) assessments where the premium can be significantly affected by weak systems for records management. There are also opportunities for Cash Releasing Efficiency Savings arising out of improvements in records management and resultant improvement in staff efficiency. There have been known to be difficulties in Coding Departments where payments can be missed if timely claims are not made; the System will help overcome these. There are also serious clinical risk management implications. There are risks to the Hospital's reputation arising out of the current difficulties. Patient satisfaction can be adversely affected. Often there is significant tension between Clinicians and Hospital Management about this issue. We find that business managers are not sure what RFID is and what it can do. To meet this need MCP provides a half day seminar to explain RFID in business terms, describe its technical features and outline a method of implementation. The seminar is delivered on demand at any suitable location. This first phase is critical to the success of an RFID project. We apply our knowledge and experience to assess whether RFID is feasible in your business and what impact RFID will have on business performance. We identify key performance indicators that can be used to measure the results after RFID is installed. With new products and services appearing in the market place we assess the suitability of suppliers and product that are specific to the application being considered. RFID tag type, antenna design and reader deployment are all important and must be carefully matched. A risk assessment is prepared so that potential pitfalls are properly addressed in a timely manner. The business case report concludes with recommended action and a time phased implementation plan. Do you lose files? Those who have already adopted the RFID approach to tracking their files don't anymore! With evidence emerging all the time of the significant business benefits of this solution, including reports of a return on investment in less than one year and impressive endorsements from existing users, RFID is the future in this arena. 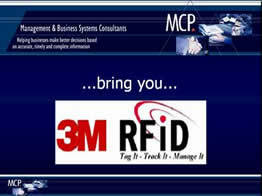 MCP have created a ten minute PowerPoint presentation which describes in detail, the use of RFID in tracking files. To view this, just click the icon below.